We’ve discussed how maintaining a beautiful lawn is a 100 step journey, requiring the right lawn care treatment for the Atlanta growing conditions. Each season requires different steps to get the lawn healthy and keep it so. During the summer, lawns are more prone to developing certain issues than during other times of the year. Here are 2 of those problems and what you should do to take care of them and get your lawn looking its best as quickly as possible. Hot dry summers combined with humid, wet periods create the perfect growing condition for turf fungal diseases which can wipe out your entire lawn in a single season. 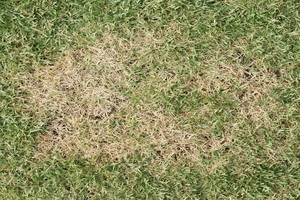 Dollar spot is one of the most prevalent in the Atlanta area affecting Bermuda and Zoysia grass. It looks like a circular spot that is only a few inches in diameter. Sometimes there are so many spots that the area could look much larger. You will have to get down on the ground to check the individual grass blades. In some cases, the grass might look more like straw than grass due to the lack of green color. These brown spots occur when the soil is dry or lacks the proper amount of nitrogen. They’re also more likely to appear when the temperature gets between 60 and 80 degrees Fahrenheit. Apply the correct rate of nitrogen fertilizer. Irrigate grass only when needed and do not subject the lawn to drought conditions. Avoid spreading the disease to other areas. Provide good drainage for both surface and subsurface areas. Correct soil compaction by core aeration. Apply lime as needed to ensure the soil pH is less than 6.0. Fungicides are most effective when used as preventative measure. Homeowners who have experienced the blighted look of a fungal disease will tell you that an investment in fungicide treatments are dollars well spent to protect your overall lawn care investment. The best solution for dollar spot is fertilization, however fungicides can also be needed for a rapid halt to the spread of a fungal disease. The best way to deal with weed growth is to prevent it in the first place. 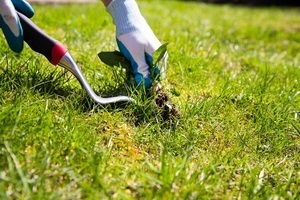 As soon as weeds start to grow, they can be difficult to remove. Weeds are more likely to grow on lawns that are too dry or too moist, which is why adequate watering is important. The common types of weed that people find in their lawns are nut sedge and summer broad leaf. In some cases, it might be necessary to pick each weed by hand. With the help of professionals, specialized weed control treatments can also be applied to treat the problem and hopefully prevent future weed growth. If you want the best-looking lawn on the block, then it’s important to accurately diagnose the problem, identify the corrective lawn care steps to take, and the right products to use. Or call a professional lawn care company and Enjoy Your Lawn.